“PETITE” REFERS TO STATURE (HEIGHT), NOT WEIGHT. Industry standard size women at 5’9″ and taller only represent 3% of women. The fashion industry is alienating majority of women around the world. According to most old school fashion designers petite is defined as 5′4″ inches tall and shorter and a select few clothing designers feel that 5’6″ and shorter is petite. The modeling agencies define petite to be 5’5″ to 5’8″ in height. There’s plenty of ambivalence and contradiction by industry standards as we’ve learned. At BellaPetite, we have established the height standard for petite women to be 5’7″ and under. The petite female market has a compound annual growth rate of 8.6 percent annually. These women represent ten billion dollars of buying power in the retail industry. In the international marketplace, there are approximatel y six hundred million petite women. Petite women’s retail buying power is tens of billions of dollars! The available statistical data confirms what we already know, petite women have the greatest buying power and are the majority globally. Yet, this market niche is untapped. Unfortunately, petite women are aware of the minimal representation, which contributes to negative images of their size, beauty and intelligence. This starts with the media, modeling industry and clothing designers catering to a market representing only a mere ” three percent of women at 5′9″ and above here in the United States.” The look constantly promoted as the image of beauty and fashion is tall and slender. This is undeniably wrong and we have standouts like beautiful 5’1″ Eva Longoria and to the right we have gorgeous 4’10” Kristen Chenoweth. Fashion magazines exclusively feature tall women, leading us to believe we live in a world with only amazon women. The majority of petite clothing designers don’t even utilize petite models. Most mainstream modeling agencies, beauty pageants, and televised model searches will not represent or allow true petite women to compete. In fact, many agents lie about models and celebrities height. For instance, Victoria Beckham is 5’2″, not 5’6 as Elle magazine stated. Reality check: Petite women are the majority and the mainstream media needs to recognize that most celebrities are petite. It’s a fact, petite women dominate the entertainment industry. Petite clothing designers and retailers need to utilize petite models to effectively promote clothing lines to their consumer market and increase profits. Petite women are tired of the lack of true petite sizing, zero representation on the runways and fashion magazines! Bob Mackie, world renowned fashion designer to the stars for over 40 years, states that he has spent his career dressing famous women. He recounts that most of the leading ladies in Hollywood throughout the years are in fact petites. This list includes: 5’2″ Liz Taylor, 4’11” Rita Hayworth, 4’10″Veronica Lake, Gloria Swanson, Judy Garland, Bo Derek, 5’2″ Raquel Welch, Cher, Winona Ryder, Megan Fox, Jada Pinkett-Smith, Penelope Cruz, Eva Longoria, Salma Hayek, Rachel Weiz, Jennifer Connolly, Victoria Beckahm, Madonna are all famously petite and the list goes on! Fun movie trivia: In the old days Allan Ladd was so short, standing at only 5’2″, that his leading ladies often had to stand in a ditch while filming scenes next to him. As you can see, it was important to have gorgeous, petite screen goddesses like 4’10” Veronica Lake! To this day most leading men in film are short and need petite leading ladies to enhance their small stature. Join Bella Petite today and be part of the petite fashion and model initiative. Bella Petite Magazine is fashion, entertainment, and lifestyle for all women. “A petite woman can be described as fit, thin, curvy and plus-sized. Free to join us! 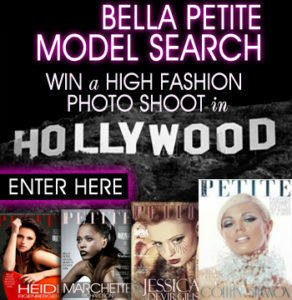 BELLA PETITE MAGAZINE MODELS SUBMISSION DEADLINE COMING SOON! Enter the Bella Petite Model Search. Win a professional photo shoot in California and editorial fashion spread. You will get tearsheets for your portfolio and modeling promotions! Enter the ONLY model search in the world for petite women 5’7″ tall and under! I like Your site. It is very interesting. Do You have RSS I want to add to my favorites. Let me know when it will be ready. Keep it UP. Thanks! If you want to add us to your RSS hit the “subscribe to feed” link at the top of the page, or if you use a client like Google Reader just search for “Bella Petite.” Thanks for reading and keep checking back, we have big plans in store!